A full moon has a relationship to the previous new moon. Your March 17 New Moon goals can now be fine-tuned or completed, it’s harvest time. You can make emotional adjustments in response to those new moon goals. The effects of the March 31 Full Moon lasts for two weeks up to the April 15 New Moon. 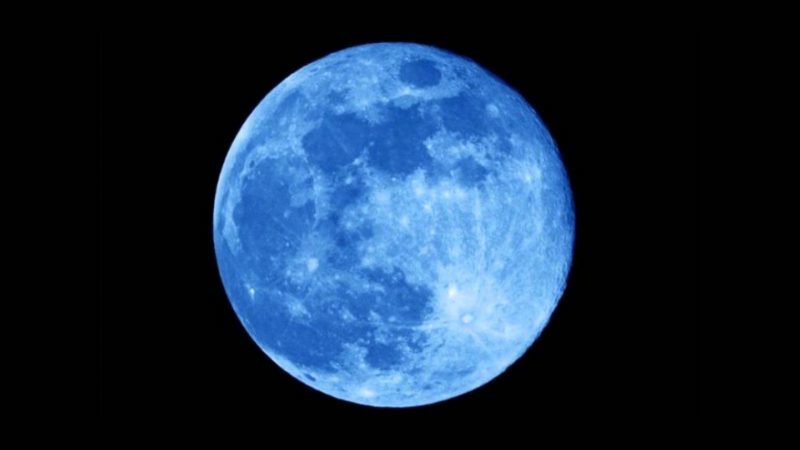 An astronomical blue moon is the second full moon in a calendar month. About 3% of all full moons are blue moon and they occur on average once every 2.7 years. So having a blue moon in February and March 2018 is very rare indeed. However, blue moon astrology is no different full moon astrology. There are no ancient myths or superstitions about blue moons. The term “blue moon” only appeared a few hundred years ago when Shakespeare used it to describe something that is rare or absurd. Blue moons are only possible using the Gregorian calendar. Most people in the world still use a lunar calendar like our ancestors did. If the Western World still used a lunar calendar we would be more in tune with natural cycles. We yearn for meaning in the moon and stars above. The Gregorian calendar is one reason we are so removed from our cultural roots. Blue is a symbol of sadness and loneliness, as in “feeling blue”. There are at least seven songs on YouTube with blue moon in the title and they are generally sad love songs. This modern cultural association holds true for Blue Moon March 2018 for a number of reasons as outlined below. The March 31 full moon aligns with two stars in Virgo Constellation as shown below. Both stars need consideration because the Moon has already passed over them, unleashing their full potential. Fixed star Porrima gives a courteous, refined and lovable character with prophetic instincts. Moon conjunct Porrima: Popular, business worries, domestic disharmony and divorce, poor health. Fixed star Vindemiatrix gives falsity, disgrace, stealing and often causes its natives to become widows. Moon conjunct Vindemiatrix: Worry, many disappointments, loss through law or writings and theft, bad health, failure in business. The Moon in particular with this star causes a fear of losing your partner. Through your own fear you could project the loss. Because these two stars are so close together and only half a degree from Full Moon March 2018, the prophetic instincts of Porrima combine with the fear of death from Vindemiatrix. This is a warning to those who dare predict the death of another person. Also, if you find yourself having morbid fears about the death of a loved one, it is critically important that you do all you can to put these thoughts out of your mind. This can be difficult with the Moon at this position because any such thoughts, feelings or imaginations will be subconscious. Thoughts are things and they have energy and can manifest in the material world. The first law of thermodynamics states that energy can neither be created nor destroyed; energy can only be transferred or changed from one form to another. Therefore, as soon as you gain conscious awareness of bad thoughts you must replace them with happy thoughts, or anything else for that matter. Remind yourself that your intuition, visions or dreams are corrupted by irrational fears. Blue Moon March 2018 gives you an opportunity to work with your fears and to release them from your subconscious. Transform your negative thought energy into positive thought energy. Once you see the Full Moon March 2018 astrology chart below and learn about all those challenging red aspects you will understand why I have stressed this point so much. Mercury Retrograde March 2018 brings communication and technology breakdowns, nervous anxiety, travel delays and lost items. Mercury stationary retrograde conjunct Venus focuses your thoughts and communications on matters of love and affection. Communication problems with your partner may arise, or misunderstandings may arise if you are dating. Ex partners may arrive out of nowhere. Moon opposite Mercury Retrograde muddles your thoughts and feelings making it hard to know what you are feeling let alone what others are feeling. You may have difficulty making sense of everyday problems. Full Moon March 2018 may result in arguments caused by emotional bias or simple lack of understanding. Try to spend some quiet time in reflection, or chat with a mentor about your feelings. Mars conjunct Saturn can ignite your darkest desires and make you angry, resentful or revengeful. Ignorance or laziness can lead to frustration and difficult situations. This destructive energy could manifest as risky actions due to impatience. On the other hand, it could manifest through another persons destructive action toward you. Full Moon March 2018 is not the right time to go to war. Stay at home and sharpen your knives, work hard with patience and forethought. Moon square Mars brings simmering anger to the surface so care is needed to avoid being hurt or causing harm. Yet again Blue Moon March 2018 signals danger when taking risks or acting impulsively. However, holding onto anger and frustration is not advised. Some degree of emotional discomfort is to be expected in close relationships, especially with women. They key is to release your frustrations in a controlled way. Courage is needed to face what is making you feel threatened. Mercury square Mars leads to rushed thinking which can make you short-tempered and aggressive. You may jump to conclusions, rush your decision-making or say the wrong thing. Disagreements, arguments and hostility are possible. Listen carefully and think twice before speaking. There are constructive things you can do to safely express this nervous energy like hobbies, creative projects and exercise. Moon square Saturn makes it harder for you to connect to other people in any meaningful way. Sadness, loneliness, guilt and shame are possible as you are reminded of past relationship failures, loss and grief. Blue Moon March 2018 asks you to take responsibility for your own emotional reactions. Blaming others for your bad mood will only make matters worse. Unhealthy relationships may end. Even good relationships may suffer from emotional coldness, nagging or bullying. Mercury square Saturn makes communicating your plans and ideas even more difficult because of negative thinking and misunderstandings. Don’t rely on the words of others, and be careful with your own. You are likely to say the wrong thing and dig a bigger hole for yourself. Full Moon March 2018 may cause some distance or separation in close relationships. This, together with gloomy thoughts, bad news or loneliness, can have a negative effect on your mental well-being. The March 31 full moon is a blue moon in every sense of the word. It is the second full moon of the month and it a symbol of sadness and loneliness. This modern cultural association seen in sad songs about blue moons is supported by challenging aspects to Saturn, the astrological symbol of sadness and loneliness. Also, the full moon is next to two stars associated with worry, fear and disappointment. In particular, fear of losing your partner. All but one of the aspects in the Blue Moon March 2018 astrology chart are challenging squares or oppositions. This will force you to do something about your fears or whatever else is troubling you. You can’t ignore your problems and hope they will go away. This is as an opportunity to work with your fears and to release them from your subconscious. If you are lonely join a dating site. If you are depressed ask your doctor for help, and if your marriage is failing see a relationship counsellor. Jupiter sextile Pluto is the one good aspect and lasts until the end of April 2018. It brings success through positive change. You don’t have to force change or react to unexpected change. This is a natural development associated with increased power and influence, spiritual and personal growth. Use this powerful force for good to transform the negative energy of the full moon into positive outcomes. Face your worries and fears head on and your life will be transformed by Blue Moon March 2018. If the Blue Moon March 2018 astrology chart directly impacts your horoscope decan you can read about it in your monthly horoscope. For more detail about how it affects your natal chart see full moon transits. eek, this exactly opposes my bf;s venus and squares my venus… this cannot be positive right? Well Esa. you have Venus square Venus in synastry so this moon is only going to activate whatever tension already exists because of that synastry aspect. My Libra moon at 10.39 in 12th house natal with my Libra sun. My ascendent in Libra at 11.11 with a 1st house Libra stellium, mars, venus, uranus, pluto. Going to be interesting. Oh wow, you have the Sun there too. If this is really close to your birthday this full moon will stay active in your solar return chart for the next 12 months. Thanks for the info Jamie. My Libra Sun in 12th house natal at 1.32. My descendant in Aries at 11.11 too! DOB 9/24/76 7:38 am in United States…Flushing, NY. I am moon conjunct pluto conjunct ascendant. Pluto at 11.11. Ruler is Venus 27.55 conjunct Mars 20.22 in Libra too. Lots going on. My mercury is in 12th natal in Virgo at 26.31. Born in Retrograde. I have one question… Like i am first decan of aries… 24 march…. And blue moon is on 10° and my decan is 0° to 9.9°…. would it affect me? Hi Ash, being born on March 24 your Sun is about 4 Aries. So you will feel this full moon but not too strongly. Btw-your site is great -thank you. Regarding your assertion that “Blue moons are only possible using the Julian calendar,” blue moons are actually also possible using the Gregorian calendar, which Pope Gregory XIII introduced in October 1582 to replace the Julian calendar. Okay thanks I edited to post. Hi, the full moon will be conjunct my Jupiter in Libra at 10 degrees in the 2nd house, I have Jupiter sextile my Sun in the 4th house in Sagittarius, Jupiter trine Saturn in Aquarius in the 6th house, Jupiter square Neptune and Uranus in Capricorn in the 5th house, Jupiter opposite P. of fort. in the 8th hosue in Aries, Jupiter trine my MC. What to expect? Will it be positvie or not? Thank you! I have been sensing a quite solid sense of hope as this FM is growing, and although yes, a somewhat frenzied reactional energy may be triggered, it has also come to mind a couple of times that this gives opportunity for the truly noble leaders among us to rise, & help overcome the fear that has become overwhelmingly threatening, destructive, torturing & killing too many already, especially due to the level of irrationality & paranoia, fear driven tactics generate. The FM is exactly conjunct asteroid Excalibur in my 12th house, I stronly feel, peace will reign in the aftetmath. i feel/have been feeling the same for quite some time now. there are a lot of forces at work at the moment and there is an ultimate, underlying feeling of peace. people are waking up a little more and being present and active. it’s inspiring! THESE FIXED STARS ARE, WITHIN ONE DEGREE, CONJUNCT THE FULL MOON. YOU CAN SEE THERE ARE LIGHT AND FAVORABLE INTERPRETATIONS BELOW. ALSO READ 11 DEGREES ARIES TO OBTAIN MORE DATA, THIS IS THE SUN’S POSITION OF OPPOSITION, 10.44 ARIES. BOTH AWESOME STELLAR BODIES ARE WHAT MAKE OUR FULL MOON. from p.182 of Star Names, Richard Hinckley Allen, 1889. Gienah: Gamma (γ) Corvus, Gienah, is a star in the left wing of the Raven. Also AUVA , 11.20 degrees Libra, should be considered at less than one degree conjunct, in the constellation of Virgo. Influences of the 11th Arabic Moon Mansion Al Awwa: Gives benevolence, gain, voyages, harvests and freedom of captives. Once again Jamie has written an awesome article for us. Thanks and love to all. This is what exactly happened to me through my friend who is my manager now. He revealed his insecurity and fought unnecessarily to very high extent . What is expatner coming into picture ? Is it a good sign ?